During the week I set a pretty strict bedtime of 11pm. This is extremely frustrating to Matt, who likes to spend some time “winding down” after work and doesn’t like being held to a strict schedule. So, what in the world could keep me awake on a Monday night until 4:30am when Matt was fast asleep? HOPE, that’s what. And I’m not talking about the Hope that Obama served up during the 2008 election – I am talking about the Homeless Outreach Population Estimate. 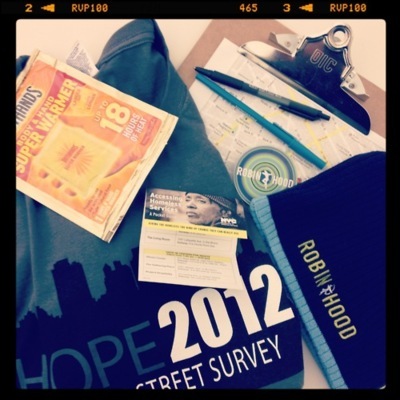 HOPE is an annual survey used to assess the number of individuals living in New York City’s public spaces. In a way, it is a census for folks who don’t have mailboxes or permanent addresses. It is accounting for the thousands of folks who sleep on the street each and every night in New York City. Last night thousands of volunteers, including 20 Robin Hood Staff and 20 Robin Hood supporters, teamed up and set out to survey New York’s streets, subways and parks. Conducted by the New York City Department of Homeless Services (DHS), HOPE is a point-in-time estimate of unsheltered individuals that helps the City evaluate its outreach programs and providers and measure its progress. To increase public accountability and continually evaluate and improve the programming designed to help street homeless New Yorkers, DHS began surveying parts of the City in 2003, and has conducted the count citywide every year since 2005. Provide a consistent year-to-year measure of the city’s programs to help those living on the streets move off the streets and into permanent housing. Provide the city with a way to measure its outreach providers. 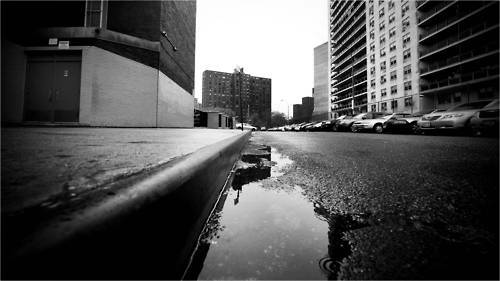 In September 2007, New York City created Street to Home outreach services, which established a single accountable provider of services in each borough. HOPE highlights areas where outreach providers are successfully moving people off the streets, and where there is room for improvement. Provide thousands of New Yorkers with an opportunity to help New York’s homeless residents, and contribute to New York City’s fight against homelessness. As Team 21 was going around our counting route, we went into the 23rd street subway station (A/C line) and saw two people underneath a blanket on a few cardboard pieces in the area outside the turnstiles. There were a few backpacks and scattered personal items, but it seemed at first like the two people were asleep. Then one of our team members heard some Spanish and he used his skills to start a conversation. At first hesitant, the man under the blanket started speaking English. We learned that the couple had been together for a very long time and that the woman, Veronica, was pregnant. After being told about the possibility of staying in a shelter last night, he was nervous that they would be separated. We made some calls and figured out that they could and would be taken to a family shelter across town at 33rd and 1st at which they would stay together since they were a family and Veronica was expecting. We called the van service and began waiting. After hearing that we were 99% sure that they would stay together, the man asked about that 1% chance and began getting a little guarded. His expression soured as we explained the possible consequences of being separated. After talking about some of the benefits to staying in a shelter and reminding them of all the potential positive impacts, we gave them some private time to talk it over, and when we returned, he had started to pack up their things. It was around this time that the woman started speaking to us as well, first joking to her partner in Spanish – luckily he explained the jokes to us – and then beginning to open up and speak English. While 2 team members went back above ground to wait for the van to come pick up this couple, another team member and myself sat down and talked with Veronica and her partner. We showed them on a subway map where they would be going, and they showed up where they had been staying for the past week. The man said that the subway was a far better option that sleeping by the River in East Harlem as they had been doing for some time. The van arrived 20 minutes after we first called, and the driver confirmed that Veronica, her partner, and her baby to be would all be staying together and going to the family shelter. We shook hands, hugged, wished them well, and kept on counting.